Naomi’s rifle is based on a Remington 700 as described by USMC Scout Sniper Joseph T Ward in his book Dear Mom: A Sniper’s Vietnam. Major design departures include the thickness of the barrel, the height and length of the scope, the size of the magazine, and the location of the safety – being in the traditional position of a firing pin. This isn’t an Earth weapon, though like other non-terrestrial weapons depicted in the comic it does take several visual cues from one. I think I got the size completely wrong. Future ATC installments will use real-world units so scale should be less of an issue – for this scene I eyeballed it and while everything looks good I think the rifle came out a bit smaller than its antecedent. C’est la vie! Naomi is carrying a hunting knife on the back of her belt. It came out looking a lot like a goth Jalapeño, so I feel like I need to say it – that is not a pepper. 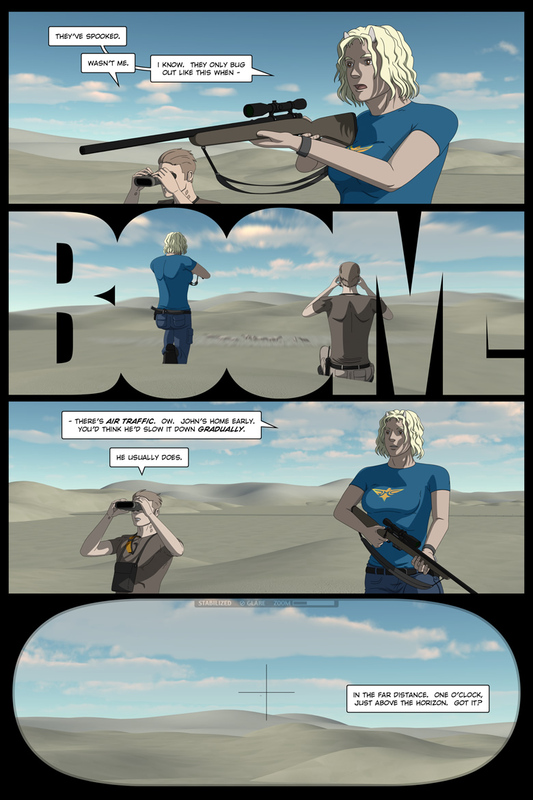 Greg’s safety glasses and radio actually look like safety glasses and a radio and descend from the reference models built for Dead City Radio, while his binoculars are based on the pair Raven used waaay back in Convergence. Greg’s wardrobe is loosely patterned after US Army and USMC desert gear, and Naomi’s is patterned after the US Air Force uniforms seen throughout Stargate SG-1. The stylized RMC on her shirt stands for Republic Marine Corps. 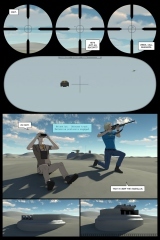 The motion blur in panel two is multi-purpose – first it emphasizes the noise and second it slams the the painted grass into the rendered environment. That’s the last we’ll see of that grass, fortunately. I’m not sure how much of that boom is the traditional physics of very fast-moving objects slamming on the brakes and how much of it is from said objects popping into existence – it’s probably a two-for-one combo. Odds are good that the atmosphere would complain strenuously about having to unexpectedly accommodate a 100+ ton high velocity brick, which may be partly why the veil transition effect has traditionally been shown as a fade – “easing in” would be the multiverse transversal equivalent of lube. 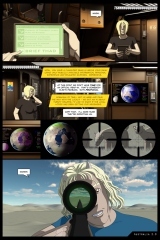 The ship Greg references in panel four was small at the working resolution and is, counting anti-aliasing, a total of six pixels at 720x webscale. It’s in there, in the upper right of the bottom left quadrant of the crosshair. It is hot. I am made of sweat and the lack of high-quality sleep one gets during a Pittsburgh August without climate control. My neighbors aren’t helping, as they go to bed long after I do and my nights this month have been punctuated by the rattling thuds of humans moving around two meters above my head. My workstation heatstroked twice yesterday, necessitating some very urgent and extremely sweaty video card surgery. Long story short it’s now running warmer but is also doing a better job of moving heat around – I replaced a 512 meg GeForce 9500 GT dual-DVI with a months-dead heat sink fan (bought 2009) with a fully operational 2 gig GeForce 640 GT (bought 2014), and the machine that was in got a GeForce 660 (gifted 2016) and now I get actual FPS in Fallout 4 and that’s where last night went. Truth be told I needed the downtime. Since I posted the previous page I’ve gotten some rendering work on the next scene but not nearly enough, and I had to lay off for a couple of days to catch up on client work and to generally feel better about existing. Rendering is a tedious experience at best and the initial work on the scene was far from “at best,” though you’ll never know it to look at the results. I’ve rendered nineteen out of fifty-five panels, and rendering several of them multiple times caused me great distress. I’ve had a couple of days to get over it and will be resuming work this weekend, either with a page that needs geometry generation or with hyperspace effects work. I’m on track to get the scene completely rendered in August though I doubt I’ll be doing much of anything else, other than documenting and posting existing pages and wringing the as-yet-unannounced achievements out of Nuka World. I’ll post the next page of the scene sometime next week. Stay cool, folks! 105 queries in 0.789 seconds.